Once you've successfully created your own sourdough starter, you'll need to feed it regularly. If you bake a lot of sourdough treats, you may want to keep it on your counter, at room temperature. While this means feeding it twice a day, it also means your starter will be ready to bake when you are. If you're a more casual sourdough baker, store your starter in the refrigerator, feeding it just once a week. To store your starter at room temperature: Stir the starter well and discard all but 4 ounces (1/2 cup). Add the water and flour. Mix until smooth, and cover. Repeat every 12 hours. Remove 1 cup starter to bake with when it's expanded and bubbly, then feed the remaining starter immediately; revert to your normal 12-hour schedule for subsequent feedings. To store your starter in the refrigerator: Take the starter out of the fridge. There may be a bit of light amber or clear liquid on top. Either drain this off, or stir it in, your choice; it's simply a byproduct from the fermenting yeast. Remove all but 4 ounces (1/2 cup) starter; see "tips," at left, for ideas on what to do with it. Add the flour and lukewarm water to the remaining starter. Mix until smooth, and cover. Allow the starter to rest at room temperature (about 70°F) for at least 2 hours; this gives the yeast a chance to warm up and get feeding. After about 2 hours, refrigerate. To ready your refrigerated starter for baking: Take the starter out of the fridge, discard all but 4 ounces (1/2 cup), and feed it as usual. Let it rest at room temperature for about 12 hours, until bubbly. Repeat as necessary, every 12 hours, until you notice the starter doubling or tripling in volume in 6 to 8 hours. That means it's strong enough to leaven bread. For the final feeding prior to baking, add enough flour and water to use in your recipe, with a little left over to feed and maintain the starter for the next time you bake. For instance, if your recipe calls for 1 cup (about 8 ounces) starter, add 4 ounces each water and flour. If your recipe calls for 2 cups (about 16 ounces) starter, add 8 ounces each water and flour. Once the starter is bubbling and vigorous, remove what you need for the recipe and set it aside. Feed the remaining starter as usual. Mix until smooth, and allow the starter to work for about 2 hours at room temperature before putting it back in the refrigerator. Sourdough baking is as much art as science. 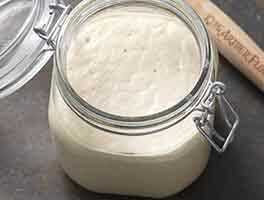 This method for maintaining sourdough starter is just one of many you might choose to follow. It doesn't exactly match the process in our "Baker's Companion" cookbook, nor some of our recipes online, nor what your neighbor down the street does. And that's OK. If you have a process you've successfully followed before, then stick with it. Or try this one and compare. All good. Use "discard" starter to make pancakes, waffles, cake, pizza, flatbread, or another treat; see our recipes for discard ("unfed") starter. Or, simply give your excess to a friend so he or she can create his or her own starter. Hi, I am in the middle if making my sourdough starter, (day three.). I have a question about storing it in the fridge and I couldn't see if it was already addressed but I would be grateful for an answer. When you remove your starter from the fridge, do you discard & feed it while it's still cold or do you wait till its at room temperature? This is the most concise, clear directional I've found to date on maintaining a mother starter. Most of the other sources I've found talk about feeding / discarding, but don't really say what you do after you've got a good starter & want to keep it going. I love that it includes directions for both room temp & refrigerated starter, too! Thanks, KAF! I've had the best experience with creating the starter and using it to bake bread. I also think the bakers helpline is awesome!! So I've created my starter using the King Arthur flour recipe, but I'm having trouble getting a "sour" aroma and flavor. My starter is about 1.5-2 months old. For the first couple weeks, it had that sour aroma. But I lost that smell, and now it smells like banana/fruit-beer. I currently keep it in the fridge w/ weekly feedings and have been baking with it on weekends. It's is very robust with rising and doubling in volume when I use it. But the flavor of the breads seem more "artisan french" than sour. 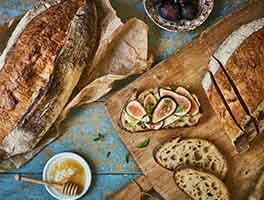 I've tried the Rustic Sourdough Bread recipe and the Extra Tangy Sourdough Bread recipes. My attempts at trying to develop a more sour starter include letting doughs rise overnight in the fridge, and using a little whole wheat every once in a while for feedings. Any other tips you might have to enhance the sourness without adding citric acid? 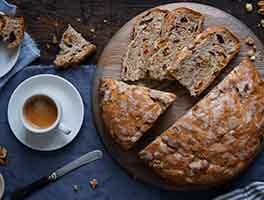 "The flavor of your bread is more dependent on your bread recipe than the flavor of your starter. Simply put, the longer your bread rises (up to a point), the richer its flavor will be. And, the temperature at which your loaf rises makes a difference. The wild yeast in sourdough produces both acetic and lactic acids as it consumes the starch and sugars in bread dough. When the dough is refrigerated, the yeast tends to produce more acetic acid than lactic acid. 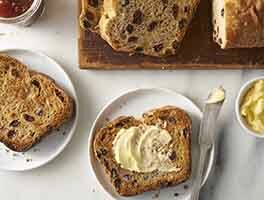 Since acetic acid is quite sour (think vinegar), bread dough that rises in the refrigerator overnight will tend to produce a more sour loaf than dough that rises for several hours at room temperature." 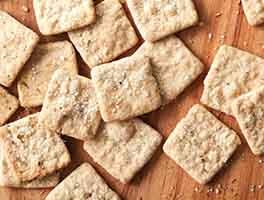 I started a sourdough starter about three months ago using the recipe from this site and have really enjoyed baking with it. I have one question on maintenance though. What colors are normal to see in my starter? 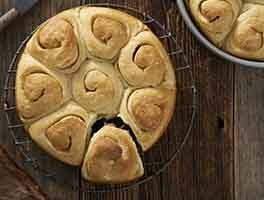 For the first few weeks it was always cream colored like in the picture for this recipe. For the last two months it has been developing a greyish-purple color on the top about 6-8 hours after I feed it. Is that normal? I read lots of info on that being normal for a refrigerated starter but can't find any info on that coloring for room temperature maintenance. I have never refrigerated my starter and have been fairly consistent with twice daily feedings. There have been a few times it was only fed once a day. The bread it produces is great and there are never any streaks of the color in my dough, just the starter. Thanks for the easy to follow steps for this! This is my first sourdough starter and I am excited to make bread with it soon. I stored it in the fridge for a week but now I want to bake with it. I know it says I should feed it before I bake, but do I need to feed it more than once if it's doubling in size and bubbling? Also, if I'm trying to increase the size to make your Rustic Sourdough bread recipe, can I just keep adding 113g of flour and 113g of water until I get as much starter as I need? When feeding the sourdough for use in a recipe, do you just add the appropriate ratio of flour and water to whatever amount of starter you have available? (possibly offsetting the flour:water:starter ratio I was previously using to grow my starter) how big of a container would a feeding of a 2C recipe? Emily, that's a great question! If you need two cups of fed starter for a larger recipe, you can add as much flour and water in a 1:1 ratio as you need, however you should know that it will take longer for your starter to eat through the large amount of new material. A mixing bowl is a good container for this, especially if you're going to be using it to bake with afterwards anyhow. You don't want to do this too frequently, as you'll want to feed your starter a more reasonable diet and discard regularly in order to prevent funkiness. But for a big recipe every once in a while it should be fine. Happy baking! I have a question for the King Arthur bakers about old starter. I left some unfed discard in the refrigerator for more than a month. When I fed it to see if it was still alive, it was, but it took 12 hours to double. My regular starter doubles in 6 hours. My question is, did the weaker yeast strains die out and leave a more hardy strain or was all the yeast dormant and revived? I've been baking this sourdough for a little more than 3 years from your sourdough starter recipe. We love it and have found I can store much longer than your suggested time. I store on bottom shelf in back of fridge. I'm writing today to ask what the best way to mail some starter out of state. Thank you! The refrigeration method works well, feeding once a week. But here's my problem. There are just two of us and as good as it is, there's just so much sourdough we can eat. Is there a suggested way for longer term storage? Perhaps freezing? I'd be happy with a once a month batch of ready starter without having to find so many ways to use up the discard.